Welcome to Day 2 of my weeklong series of Summer "Unschooling!" Yesterday, I shared a few brief thoughts on why this unit study-Charlotte Mason-living literature-Thomas Jeffersonanion-Montessouri-notebooking-slightly textbooky-ECLECTIC momma somehow morphs into an UNSCHOOLER for the summer. I also presented a handful of ideas for encouraging creative writing while on a school-time hiatus. Today, let's take a look at Un-schooling Science. Science, especially anything related to nature and the great outdoors, gets a little tricky during the school year in my neck of the woods. Unless we plan to study hibernation and/or dormancy, our nature study is limited to whatever happens to be able to withstand several feet of frozen "white." 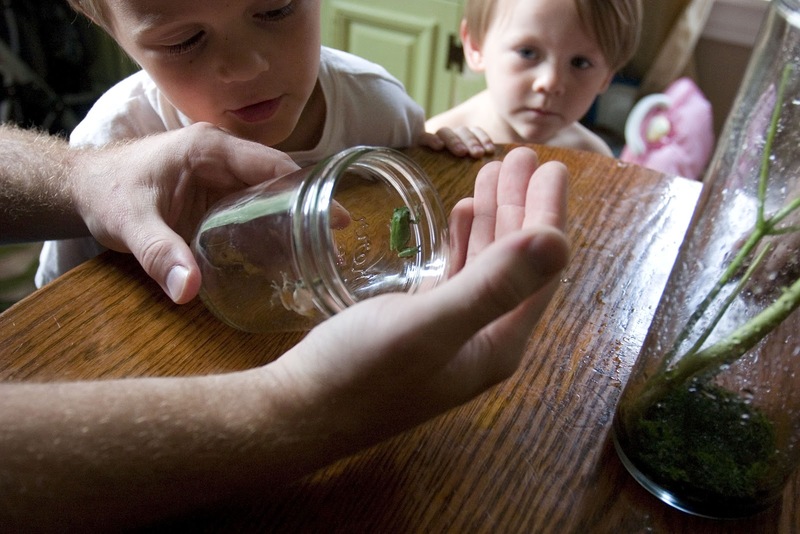 Four years ago while chatting with some homeschool veterans, I decided that although I would continue to teach science throughout the school year, I would focus much of our science efforts during the summertime. Throughout the year, I make a mental note of what natural interests my kids develop as we read books together. If possible, we revisit those themes when the snow melts...or June starts...whichever comes first! These summer-long units are very organic. I don't really do any planning. We simply read a lot of books, observe, make theories and test them, and do some notebooking to document our discoveries. I thought I'd share a few of our past adventures in hopes that it might spark an idea or topic of interest for your summertime learning. The Deputy's Wife is my go-to science gal. A few years ago, she was gracious enough to scour her property for milkweed and the little caterpillar critters that take residence on them every summer. She helped us nab a few to keep in a homemade observatory (a large pickle jar with netting over the top). We were able to watch the fascinating life cycle several times before summer's end. After releasing quite a handful of monarchs into the wild (One even accompanied us on a vacation up-state and was set free at the crest of a large hill), the children made some Eric Carl-esque paintings and set their findings down in the form of a hand-made book. Come spring/summer, our area becomes an Audubon birder's paradise. With a few field guides and a homemade birdwatching notebook at her side, a then first-grade Sweetie Pea, set about to document every bird she saw. She even stopped in the middle of a Community Ed. soccer game to run over to the sidelines and tell me she saw an osprey's nest above the light pole. 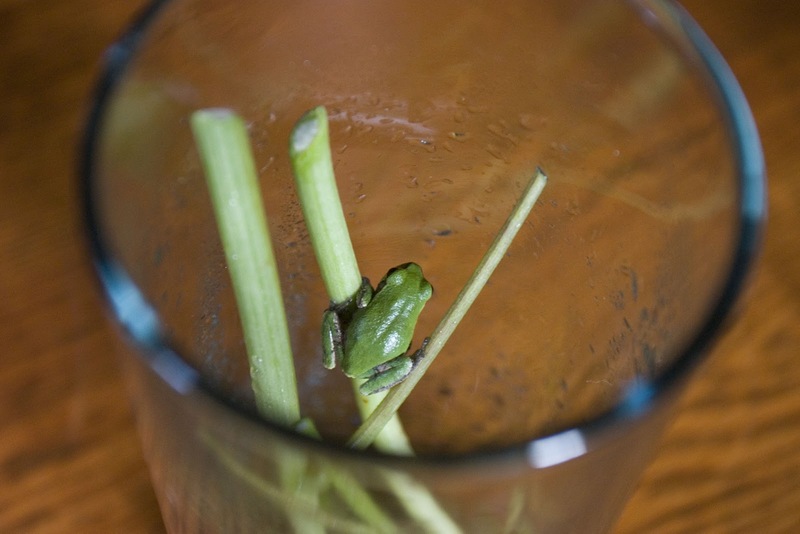 For years, we have had a family...and eventually a LARGE community...of frogs and toads living in our basement window wells. One summer, I had a plan to do a nature study on ants. I had prepared a notebook filled with observation activities, checked out several books from the library, and had bookmarked several scripture verses about ants in order to incorporate a character study using ants as a natural example. But, after only a few days of our study, it was quite clear that the frogs were much more intriguing to my little learners. In the true nature of "unschooling," I scrapped all my PLANS and enlisted the Hubs to help the kids round up some little leapers. Since this truly was a "plan B," our learning took place mostly through observation and care/keeping of the little critters. 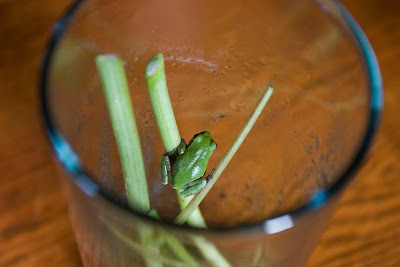 My boys especially loved discovering the eating likes/dislikes of our "house guests." Now, before you write the "unschooling authorities", I realize that a pre-planned unit does not necessarily qualify as organic learning. That being said, I do think that TOPS Learning System books are excellent resources to jumpstart the natural learning process. 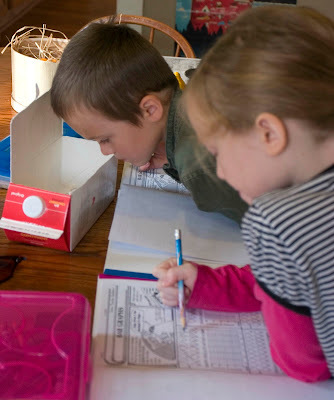 They encourage exploration of a topic by presenting NUMEROUS projects that follow the steps of the scientific process. We completed the Tops Radish kit this past fall and are spending the summer working through their Corn and Beans biology unit. A couple of things to remember when embarking upon a TOPS series: The units are written for a five-day-classroom situation. In order to complete the projects correctly, a pre-planned timeline has to be strictly followed. Our Corn and Beans unit takes 5 weeks to complete. Missing even ONE day in those five weeks makes a few of our experiments a moot point. The books include lab instructions and journaling pages that can be photocopied for each child. I put all of these into pronged folders for my kids to fill out. Most of the TOPS units have suggested age-ranges. Be sure to choose the right range for your household and read all teacher notes before beginning. Lord willing, we will have many summertimes in our future to be able to use these same patterns of natural learning to explore these other topics. Not wanting to commit to an entire summer of scientific discovery? No worries. Many topics can be explored in a few days or even a few minutes. 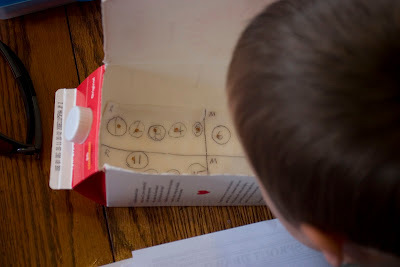 For my littlest learners, an egg carton nature hunt is always an annual summertime staple. Before heading out on a walk through the woods or a state park, we each paint the insides of an empty egg carton. Each cup is painted a different color. As we walk, the kids attempt to find a natural element that is similar in color to each of the painted egg cups. When we get back home, we share our findings, try to determine the name of each, and do some nature drawings of our favorites in a nature notebook. 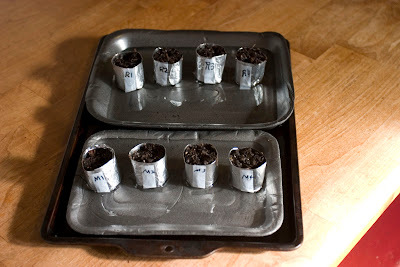 This has proven to be a great way to encourage thoughtful observation as we "commune with nature." Super Boy, especially, gets a spark every few weeks to search out a new topic. This often comes in the form of gathering a collection of similar items. Rocks, shells, leaves, and feathers have all made their way into a treasure box or dresser drawer for safe keeping. Even though his reading level does not enable him to actually read all the words in it, I provide Super Boy with a simple field guide, to encourage investigation. He looks through the pictures and finds an item with similar characteristics to the one in his collection. During the summer, our discovery quiet time basket becomes a hub of organic learning. It has been a great way to introduce numerous new topics in order that my kids can develop new interests. I fill much of the basket with nature and nature-study resources. I realize that science and science projects can make many mothers shudder, myself included. Just the THOUGHT of cleaning up a mess can be exhausting. Saving science for summer can be a great, less-busy time to encourage the disorder/clutter that comes with exploratory learning. Holy Moly do I love this! Thanks for all the great ideas! Thank you for visiting our blog today and for your kind comments! I loved reading your latest post. I jotted down a couple of those ideas and will try them out with the littles. Blessings! Glad to hear it! Hope you swing in again soon. Wow! Thanks, Kristina. Glad you stopped by. Great ideas! This is how children should learn. Love Love Love your ideas!!!! My 4 boys LOVE science and we are always doing unit studies. So thankful to have found your site. I was positive that you did not want to be associated with unschooling. That was the vibe I got from one of your other posts. So, my question, then, is why are you using the term unschooling? 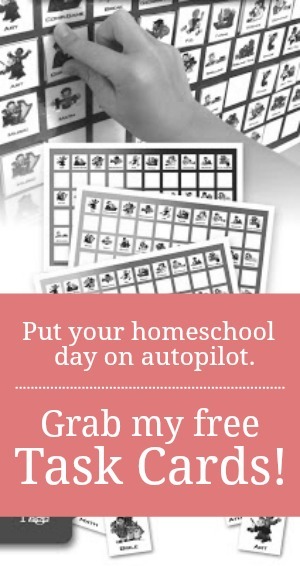 Unschooling is a style of homeschooling and not something you just do during the summer months. Here is your condescending post about unschoolers. 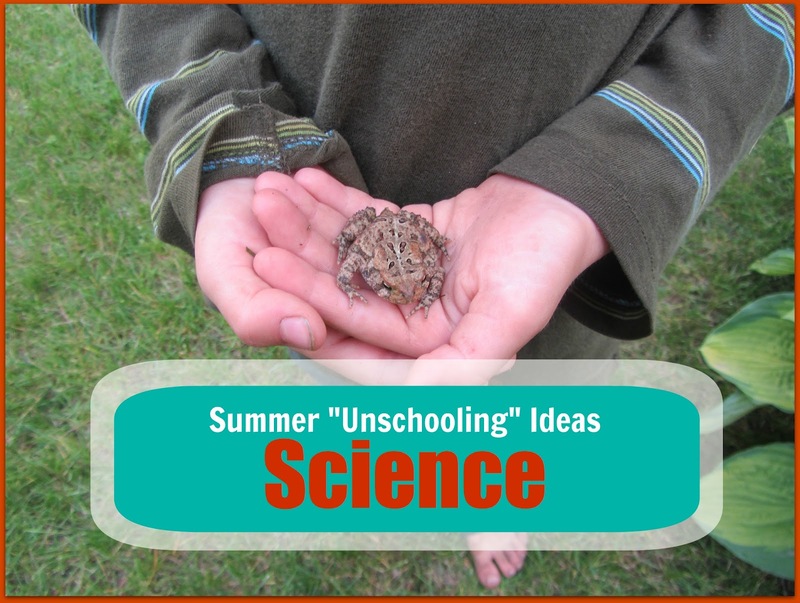 It seems to me that writing this post and then calling yourself a summer unschooler on this post is pretty hypocritical especially when you claim that unschooling breeds self centered children. If you are a regular reader of my blog and not just take one post completely out of the context of the whole, you would know that I am NOT an unschooler in the same sense that I am not ANY kind of schooler. I am eclectic which means I don't marry myself to any one method. I use a little bit of everything through different seasons and subjects. I think that unschooling has its place in the same way that Charlotte Mason education or classical or any method has its place. I take the best and leave the rest of ALL of these methods.